The CadMouse Pad Compact is ideal for mobile workplaces or setups with limited space. With its low friction surface optimized for our sensors and a three layer construction for stability it is developed to provide you always the best experience. While working in CAD applications, your daily mouse movements sum up to kilometres. The high-quality micro-textured coating of the CadMouse Pad offers effortless precision for your engineering tasks. In combination with the PTFE feet of the CadMouse, the CadMouse Pad allows smooth, accurate control of your mouse. Desktop surfaces are not optimized for mouse sensor performance. 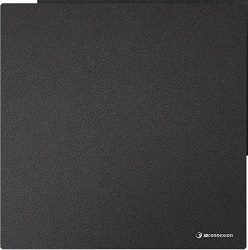 In addition to its tactile advantages, the low friction surface of the CadMouse Pad enhances its tracking qualities whether you work with the laser sensor of the CadMouse or the optical sensor of the CadMouse Wireless. This ensures accurate sensor imagery for an exact translation of your hand movements into cursor movements. The surface enhances precision while the rigid middle layer ensures stability. The silicone base keeps your CadMouse Pad in place so it won´t slip while you are working. Experience industry-standard CAD features, precise 2D drafting and 3D design tools, and advanced .DWG file support. When you purchase a Dremel 3D Idea Builder, you are getting more than just a 3D printer with software and filament. Record documents and notes on the move in high quality, and then turn your speech into text. With a SolidWorks® background, you’ll have a clear advantage in the engineering or industrial design job markets. Delivers unparalleled value and productivity in a professional 2D/3D CAD package.